I haven't gotten to play in like 3 months, so I'm very behind. Not sure what Mass Repel is? Do you mean Mass Dispel? Yeah, that hits me as a random cast Sorcery Spell. There's no way around it. It'll just dispel all my buffs, but Wolper re-casts. I started using Fury Swipes, which basically ended the battle upon my turn. Cast on Hit properties + Fury Swipes + Life/Sorcery casts from Super Wolper = dead things. Even if you hit for 1 damage, it's basically constant attacks. I hit the last 5 floors a while ago, and defeat the game. As a single lone wolf. Mission accomplished! Does Mass Repel ruin your combo? Some of the goals left from Day 6 are still on the table. I tried out Lightning Cerberus, and really didn't like it. Even with some awesome supporting gems, it just wasn't working out as well as I'd hoped. 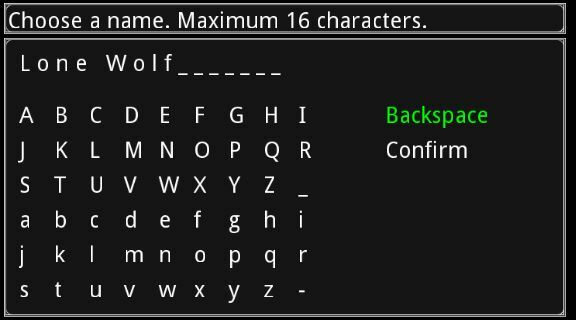 I immediately breed Super Wolper, level up some, and continue onward! The addition of Life Spells amounts to about a wash in terms of battle speed. On the one hand, I have to wait for additional cast animations from Life spells, on the other, I gain heals, stat boosts, and Equilibrium. The bad part, is Divinity. It's more of an annoyance, because it essentially resurrects the entire enemy team. By that time though, Super Wolper is already powerfully buffed up and merely kills them again quite easily. It's the repeated Divinity casts that get annoying (or with creatures that also revive themselves). I suppose it's better than Chaos Wolper casting Anger twice, or Death Wolper casting Dark Ritual. Nature even gets in on the "bad for you" spells when things like attack and defense get lowered from Iron Skin or Stone Skin. Sorcery is the only "safe" school to randomly cast. Yes, Sorcery is the "best" Wolpertinger. This boss combo is bad news. Starting the battle with Invisible is the only way I could do this boss as a single creature. One good flurry of attacks and spells from Super Wolper wiped them all out though. Super Wolper was also half their level. #2 Convert from using Wolpertinger to Lightning Cerberus. I think this guy will be a real beast. #3 Defeat some more bosses, and achieve Realm 35. As a single creature user, I would think these guys would be a bit more difficult, because they buffed up when the other was killed. But as it turns out, the flurry of Wolpertinger attacks and spells ended them quickly. I even had what I would consider to be a very poor matchup, with a enemy Dragon Scout, Apis Guardian, and Pit Worm in their party. The Dragon Scout had a very good possibility of lowering my attack and present an unwinnable scenario. However, I was able to cast Water Enchantment which offset that. This guy's trait is to give everyone Scorn. Unfortunately (or fortunately), enemy creatures are unaffected by this. This battle was fairly easy, despite the fact that I couldn't attack. 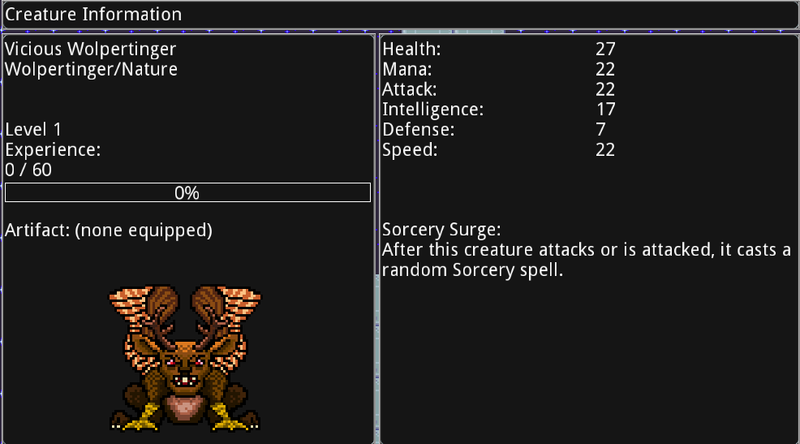 I've got Wolpertinger that retaliates on every attack with spells, as well as a plethora of cast on/when hit gems. I had zero issues here. 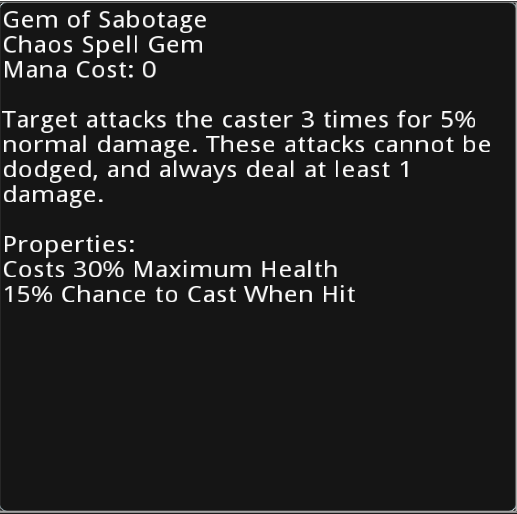 I've acquire a few more cast on hit gems, maximized my spell gem slot trait, and have an artifact with 2/2 spell gem slots. Wolpertinger + Pride is just wrecking face. He's been able to take down groups 5x his level. He does 1 damage until Shellbursts start piling up. At a certain tipping point, enemies simply lose too much defense and can't cope with the damage. Mainly it's due to the massive amount of buffs and debuffs (both stat and status) that can he apply in a single turn. Along with the Rage Blood Ritual, Shellburst has been a key to lowering enemy defenses and winning fights. Oh, and ignore what appears to be a second Wolpertinger. That's just his evil twin brother that shows up when he casts Haste or Rabid Dementia. Unfortunately, he's evil, so instead of giving a free turn as it would indicate, he just vanishes suddenly (with all your money, too! Oh wait, that's a real brother...). My plan is to keep Wolper... I think as a Nether, the access to healing spells from Life as well as Equality and Humility will allow him to go further and quicker. Overall though, I was disappointed by the experience gain vs high level creatures. It's not really worth it like in previous patches. Before Nether time though, I've decided to ditch Pride (multicast and multistrike) in favor of Wolper Life. I found a material for the Life Wolper, so he'll be casting 1 Sorcery and 1 Life spell for each attack he dishes and takes. 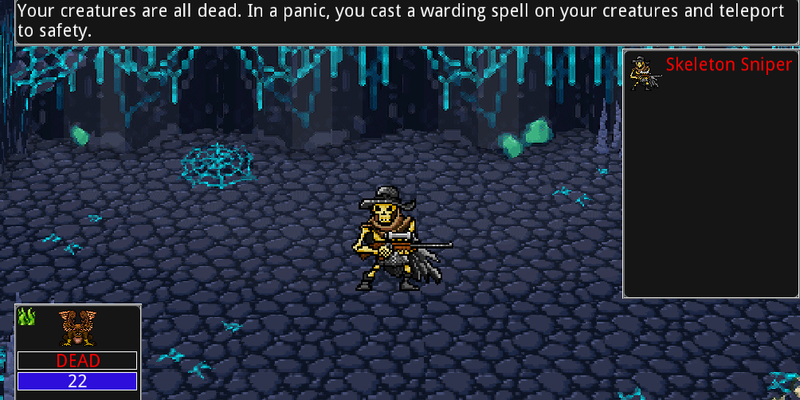 Don't forget, Sorcery has Spell Flow so the fun still continues. 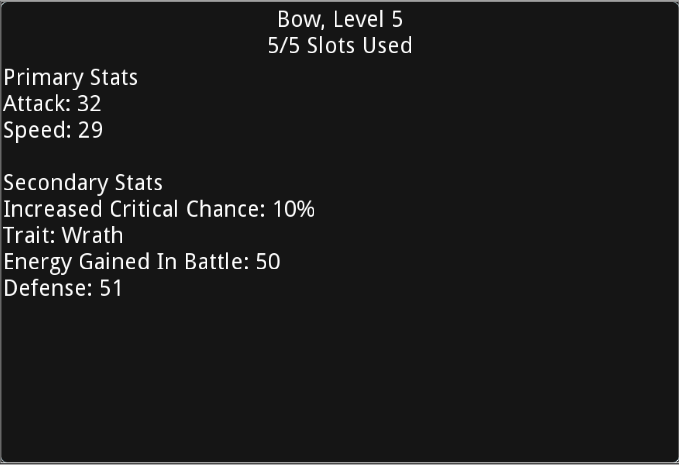 This gives me access to heals, some additional buffs, and Equality/Humility. All random, but Wolper throws out a ton of spells. I call him... Super Wolper! Like day 4, I must build up Wolpertinger through breeding a bit more. I also require more Mage levels to unlock the spell gem merchant, which will be key. Prior to moving on to another creature will be having access to a plethora of spell gems. I also have 10 Deity points to spend. All 10 points go to Cooking Buff Duration for a 50% increase in buff time. The next 75 points go to Spell Slots. Spell slots have served a vast determination in winning battles, and more will only do better! This time, it's Deathwalker on lv. 23. He comes with a trait that makes him immune to both attacks and spells, as well as giving him Blight. Here's a boss I thought I would have some trouble with as a single creature. NOT SO! 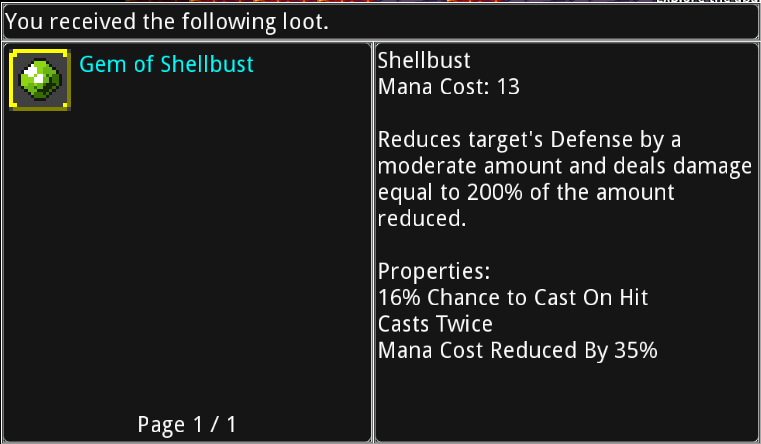 The boss was kind enough to have an artifact with Leech on it. Every time he hit my Wolpertinger, he hit himself. Leech is slow though, so I hastened him up with Jinx. Goodbye, Mr. Boss. Next up: gain some rep with Tartarith! He has some valuable Blood Altar powers that need to be unlocked as well as the Aftermath gem. Drought and Amnesia will both fit nicely and get activated. Additionally, I don't really need to see enemies at this point, and Shortsighted gets activated as well. The final merchant gets unlocked as well. YAY SPELLGEMS! The new spellgems will serve to unlock Lightning Cerberus for me. 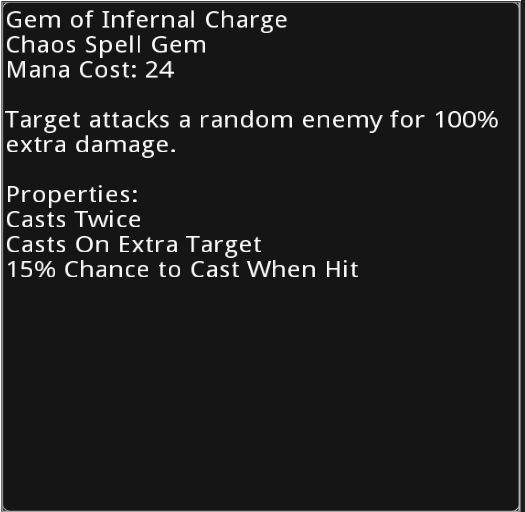 It's useless without spell gems to power it, but now I have access to many Chaos Gems that I'm lacking. Off to visit Tartarith to gain some rep in order to purchase Aftermath gems. I don't gain enough for Aftermath. That will need to be saved for another day. Today will be spent mainly building up power in older zones. It's clear that Wolpertinger is losing it's edge. Part of the reason is because of the Sorcery component that Vicious Wolpertinger has. Sorcery doesn't have a great amount of attack spells. It's time to breed a new Wolpertinger, though. I choose one of the creatures in my stables that doesn't amount to a new breed. In return, I gain a Wolpertinger +4 at lv 1. I won't be boring you with details of the returning realms, since the content has already been conquered. I focus my efforts on Aeolian, God of Wind. I desire the Tier 3 upgrade to move faster in realms. This will greatly increase my efficiency. My first perk! And boy, is it a doozy. After acquisition, Wolpertinger seems invincible. It barely takes any damage, and easily one-shots foes. By the time I reach Realm 11, Wolpertinger is already back to lv. 11. This boss is a joke. There's 3 copies of him, and they all attack in retaliation. Great, but I have a Wolpertinger. Caught a Spell Breath, Chain Lightning, Water Enchantment, and Spellflow on the first volley. Oh, now it's my turn. I attack, all 3 retaliate, more spells fly, and that's the end. The battle is over the first round. They didn't stand a chance. I return to the castle with a new Nether Orb. Two more rituals are available, and I start both. I breed Wolpertinger again. Because well... I can. In return for starting again at level 1, I receive a Wolpertinger +8. Not too shabby! Focus is on attack, intelligence, and speed. I return to some easier realms to rebuild level. Merchant and Improved Forging complete. From now on, assume I'll be visiting the Merchant on every return trip to Siralim. The Merchant only offers me artifacts for now. Hybridization is my next perk. Yes, I only have 1 creature, but it is a 10% gain on Health, Defense, and Speed. I return to early realms to gain more experience. Flubris doesn't stand a chance. His immunity is to either attacks, spells, or both. But Wolpertinger does both. Constantly. Back at Castle Siralim, it's time to breed again! 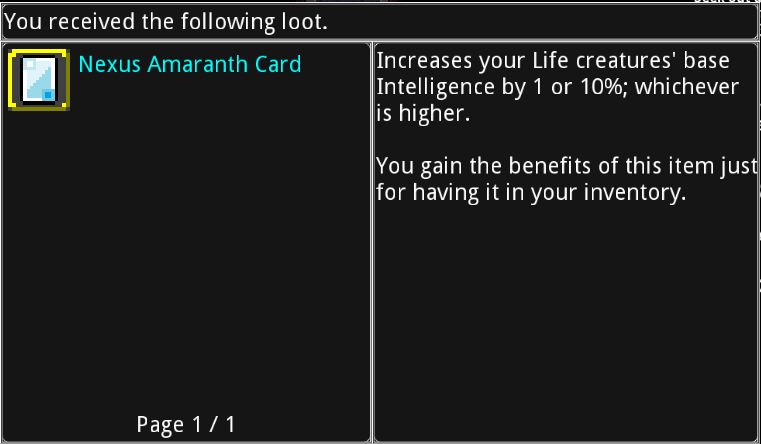 In the journey to regain levels, I find a Wrath artifact (see below). It turns out to be quite a game-changing for little Wolpertinger. He throws spells without a care now, and frequently casts Multicast on himself too for even more fun. Things definitely start to get crazy in battles. I drop the summon spells entirely. There's no need for them at this point in the game. Altar of Blood ritual gets passed. I immediately enable Nervousness and Torment. Shackler goes down quite easy. Purple > Blue > Yellow. Multistrike certainly helped here, as well as having just one turn at a time. I tried Volcanic Wolpertinger out. It didn't work out so well... when it cast Anger, I had a good chance of losing the fight. When it cast Anger twice in a fight, I definitely lost. Anger: Target ally's Attack is set equal to its Intelligence, and then it loses 50% Defense and its Intelligence is set to 1. Yeah, big joke, huh? When it's cast twice, Attack and Intelligence are now both 1, and you've lost 75% of your defense. Good luck winning! 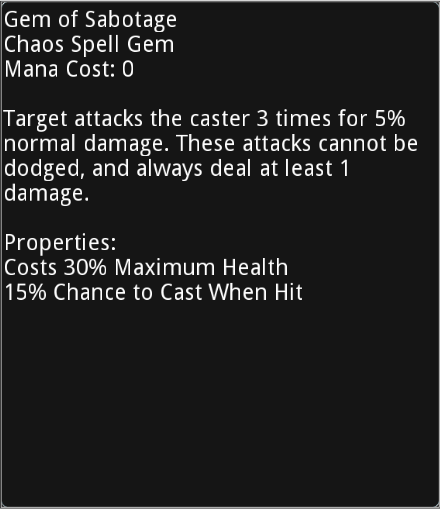 I truly like the Chaos spells, but I can't have a random cast like Anger causing random defeats. I also pick up the Resourcefulness perk. Extracting is getting more and more difficult. Note: Some people have been curious on how much I die. I'll screenshot it at the end of day stats now. 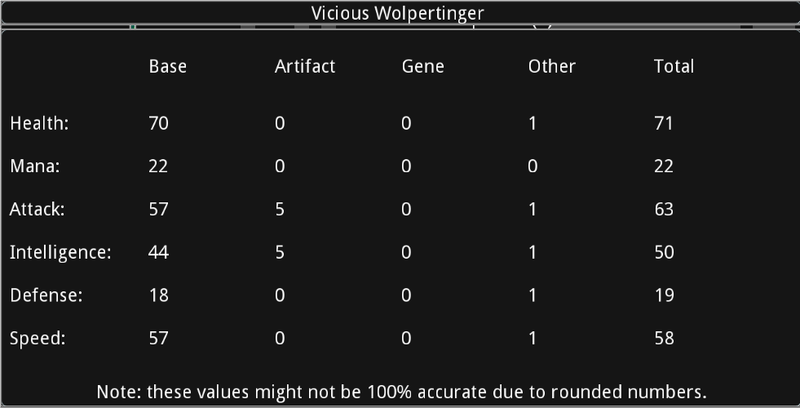 Wolpertinger does fairly well, but there's some issues with Lone Wolf like debuffs being able to pass through it sometimes. I still have to be VERY mindful of my stats, especially Defense. There's also odd matchups that result in stalemates, or an outright defeat against a stalemated PitWorm. Murder of Crows and similar spells also are kind of wonky with a single creature. After yesterday's lengthy stalemate, I'm back at it for Day 3! I begin the Enchanter Ritual prior to departing to my next realm. The majority of this realm is spent acquiring Cores of anything I fight. I complete the realm with Gonfurian at Respected and acquire the all-important Alteration spell. 29/50 Deity Points for Lone Wolf. Enemies are now level 6 and appear in packs of 4. Wolpertinger still has the level advantage which also confers the speed advantage. I complete the realm with Lister at Respected. Another Alteration Spell! 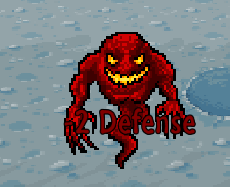 Realm Level 7 contains Andrick, a tough boss for a one-creature army. Alas, despite the level difference, Andrick acts first and wails on my lowly Wolpertinger. He manages to live, but only with 4 life. Wolpertinger immediately summons 2 allies! One is an EXTREMELY lucky summon with Thunder Storm appearing. Andrick continues to summon more creatures that all target the Wolpertinger. But due to Thunder Storm's innate trait, it doesn't die. Wolpertinger retaliates with barrage after barrage of spells - even as Andrick continues to summon and revive his entire flock. Wolpertinger tears Andrick a new one! All hail Wolpertinger! I return to my castle. Enchanter Ritual has been completed, and I begin the Chef Ritual. Damaos is impressed with my boss killing skills and decides to build me a Hatchery! For free! How nice! Wolpertinger isn't living too healthy these days, either. Too many creatures out there that wish to eat it! Time to utilize my Blacksmith. Unfortunately, creating a new artifact has rather limited options. I'll keep my staff, reforge the base stats (Int and Atk) as well as add 2x Def Slots. Enemy creatures are now level 8 and in packs of 5. There is not enough reputation here to gain Respected. No Alteration spell. Creatures are taking longer to kill, and the threat of death is much more imminent. I continue to press on, however. Zonte rewards me with Respected reputation and some Deity points! Many close calls here. Most battles require 2 summons, plus lots of buffing. Because the summons have random spell gems, I never know how each one is going to turn out. Wolpertinger still has the speed advantage, but is slowly losing ground against the enemies. There's not enough rep to acquire the Alteration spell, but Chef gets completed. I return to Siralim Castle. More adventures tomorrow. HERE WE GO! Meraxis reputation is going to be a key to success, as he controls the Nether Goblet. Enemies are level 5 and again appear in packs of 3. Despite the level difference, Berserker Fiend can one-shot my little Wolpertinger. Luckily, little W is faster and goes first - which means, two creatures to summon! I acquired both a Fallen Carnage as well as Beserker Fiend Cores through extraction on this Realm Level. Sadly, there is not enough reputation inside the realm to garner an increase with Meraxis. No alteration spell or deity points acquired. Wolpertinger is now level 9. 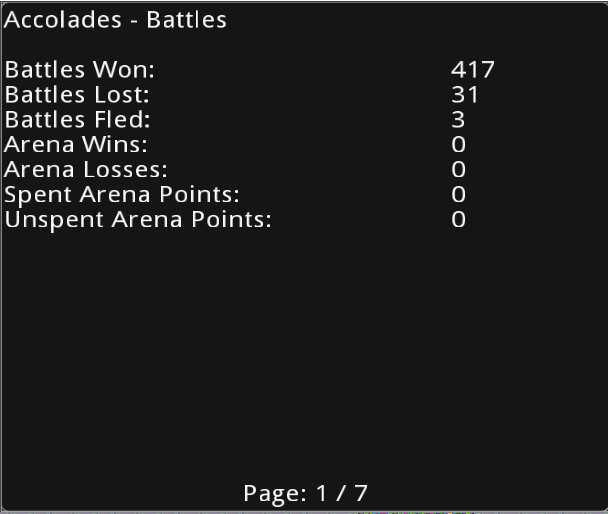 Not quite sure where the 1s in the "Other" column are coming from - I possess no cards. I head back to the castle. Both the Fiend and Carnage are excellent creatures, but I have the current problem of having nothing to truly power them. I lack both suitable Death and Chaos gems, as well as artifacts with needed enchantments like Splash, Berserk, or Multistrike. For now though, I decide to summon both and stable them for extra XP - just in case I find an artifact or stumble across some great Death or Chaos gems. Creatures are now level 6, and come in packs of 4. Challenge accepted! 500%! Creatures still hitting for 0. 5160%. No sign of ending on either side. Definitely something wrong here. Time to call it a night. Even if I managed to deal 1 damage, the spell might trigger again and lower my attack. Unwinnable. Off to get my initial spell gems! Had a bit of luck here, got a decent line-up, and the all important Summon Nature spell that will play a key role in my single creature efforts. Chain Lightning is also going to be extremely helpful as it has Cast when Hit, HP% cost, and Cast Twice. Wind Enchantment doesn't really help at this point as Speed won't matter as much, and neither will Grace without the appropriate Mend or healing mechanic. I've equipped my Wolpertinger with the Chain Lightning spell as well as the 2 Summon Nature. Away we go to the first realm! My first objective will be to obtain reputation with Meraxis to unlock the Nether Goblet. But it's quite random which realms I can go to initially prior to using Alteration Spells. First Fight - Skeleton Sniper. 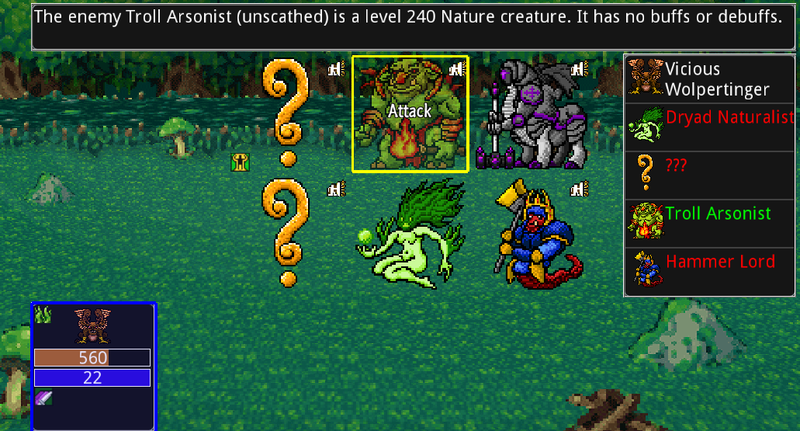 Could be trouble here, as his trait can easily one-hit kill at low levels. And... that's exactly what occurs. Skeleton Sniper is faster than my Wolpertinger, and hits for 63 damage, nearly twice what my Wolpertinger has in health. gg, Wolpertinger. First (Second) Fight - Dusk Crusader. Sort of a similar situation here, I need to kill it before it starts to gain a massive Defense advantage. My Wolpertinger acts first and casts Summon Nature (w/Cast Twice property) to gain 2 allies. One is a Brownie Trickster and the other is a Gruesome Gargantuan. 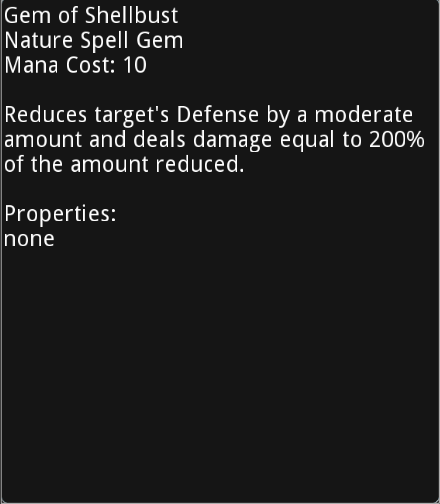 Neither trait is really helpful, but they have some decent buff spells. The Crusader hits, and leaves my Wolpertinger with 3 life. I cast Wrath of Nature to buff attack, and Snowstorm that manages to freeze the Crusader. Wolpertinger attacks, and handily defeats the Crusader with it's buffed attack. Second Fight - Coast Watcher. Not really afraid here. Same as the first fight - cast Summon Nature and gain two allies. Attacks handily defeat the Watcher. Wolpertinger is now lv 2, and is handily one-shotting enemies. Summoning allies is no longer necessary at this point. No treasure of note was obtained. There is no god/goddess on Realm 1, so it's back to the castle I go! After speaking with Damaos, it's back to the depths. Rather than select Realm 2, I venture back to Realm 1 to gain some random god/goddess favor as well as some experience points. Realm 1 Again: Where the Dead Ship Dwells - Friden was randomly chosen. 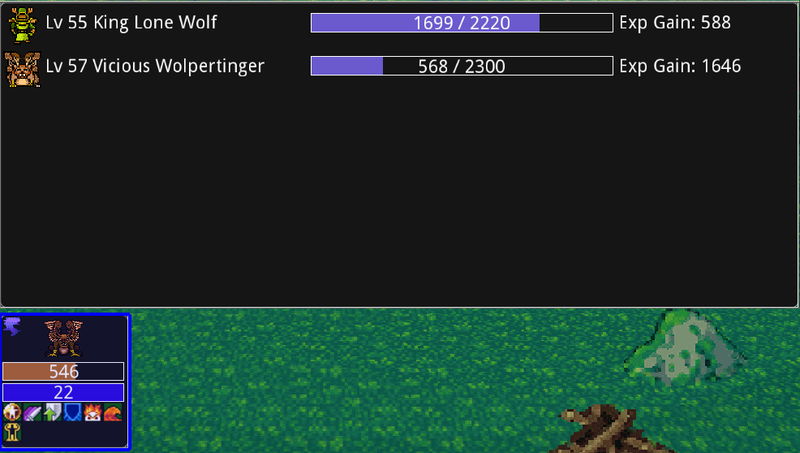 Just like my first foray into Realm 1, my lone Wolpertinger is handily defeating enemies. This time however, I can actually meet with the god. By the end of this realm, Wolpertinger is now lv 3. I did not gain enough favor with Friden to acquire the alteration spell. Onward to Realm 2! Staff lv 2 w/2 additional spell gem slots property. Creatures are now not only level 2, but appear in packs of 2. I've returned to using Summon Nature just for insurance. I stumble across alchemy tables, and choose to fight the Failed Experiment for the 10x Exalted Emblems. Chain Lightning handily defeats it after it starts to split. Skeleton Sniper are still problematic, despite the level difference (fwiw, I think their damage calculation is wonky). Not enough rep from Zonte to unlock the alteration spell or gain any Deity points. Still at 0 Deity points and need 50 to unlock Lone Wolf. I choose to equip the Death Shield for this fight, knowing that it's a Death creature I face. I doubt it will make much difference, as I'll primarily be summoning. The Death Shield didn't make a difference. The level disparity was too much for the lone Wolpertinger, and I faced defeat. I head back to Realm 2 to try and gain cores, as well as more XP and some Deity points. Aereolian is gracious enough to give me over 500 points on the level, so now I'm at 5/50 points needed. 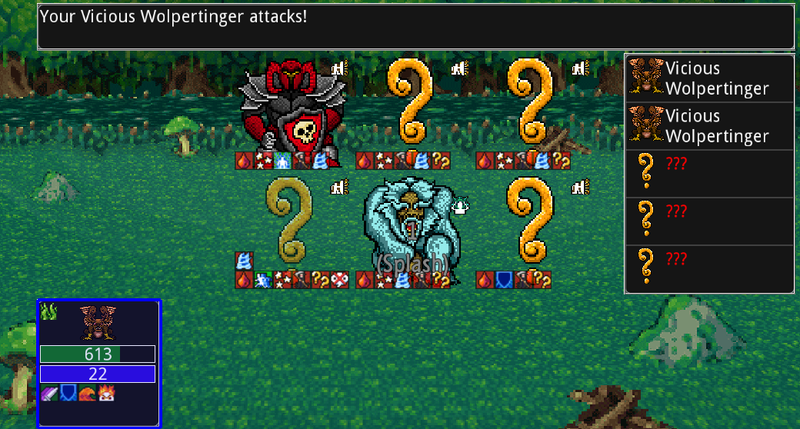 Wolpertinger ends Realm 2 redux at level 5. ...mostly all useless cores, only suitable for breeding fodder. Dusk Crusader is the only creature to consider in such a challenge, or possibly Iron Golem for an extraction to Regal Golem. Regal Golem however, is incredibly slow and needs to be able to survive at least 6 hits including disables and spells. The 25% heal doesn't seem worth it. Dusk Crusader likewise falls into the same trap as Regal Golem. Speed is certainly an ally here, and neither have it in abundance. #2 attempt at the boss. This time, Wolpertinger gets the upper hand early. All 3 creatures manage to be faster than my Wolpertinger, but he lives! 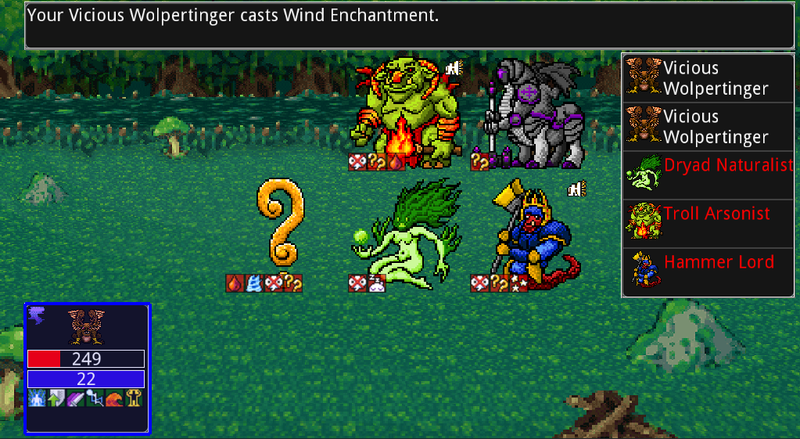 Enemies eat 3 random spells in retaliation, and the boss' shell is removed. Summon 2 creatures, and the battle is mine. A lucky Waspid Soldier appears that takes a huge chunk from his life. My other creature casts Poison, and it's a win. Wolpertinger is now level 6. Sadly, no treasure of note. From the castle, I begin the Blacksmith ritual. Gonna need that guy and soon! I head back to level 3 to gain more XP and Deity Points. Creatures are still in packs of 2, level 3 in this realm. Wolpertinger at level 6 has no issues with these. Azural was kind enough to grant me enough rep for some Deity Points. 10/50! There are now 3 creatures in a pack, and they are level 4. 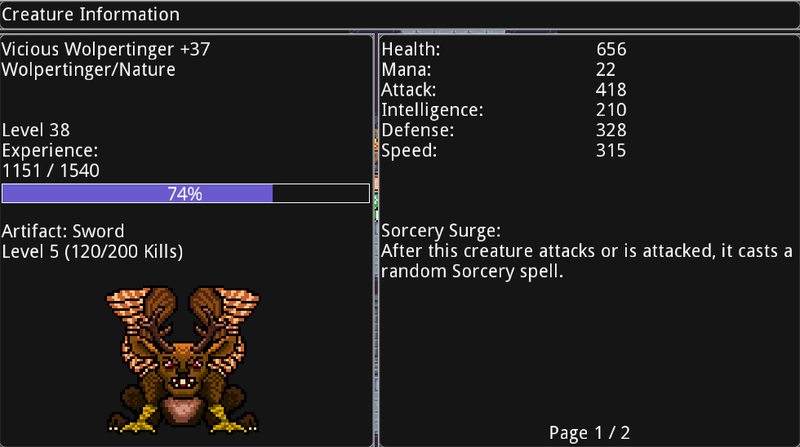 Wolpertinger still is a bit lacking in stats, so I'm still using caution relying on the Summon Nature spell. Chain Lightning can kill the entire pack, but it's also likely that they could live even with 2 castings. With it costing a hefty amount of health, I avoid using it until I've summoned. Even a lv 4 Mimic vs my lv 7 Wolpertinger, and I just barely eeked out a first turn. Immediately summoned some allies and Wolpertinger bought the farm on round 2. The Mimic didn't like the Germinate spell I cast on him though, and it was defeated in the next few rounds. Vertraag gave me some rep though, so now I'm 15/50. No treasure of note. 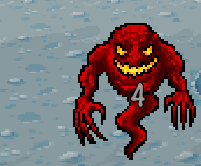 So much for Realm 4. With the Blacksmith completed, I head back to the castle. Wolpertinger is now 8, and Realm 5 awaits. My initial creature is the Sand Giant. Not a bad guy, decent trait, but he's going to take forever to hit (and thus kill) anything. He's definitely got some sustain. Shellburst! It's based on Int, so it doesn't suit the Sand Giant all that well. Arrive at the castle, and Damos lies to me. I'll show him! This seems more of the creature I want to use. 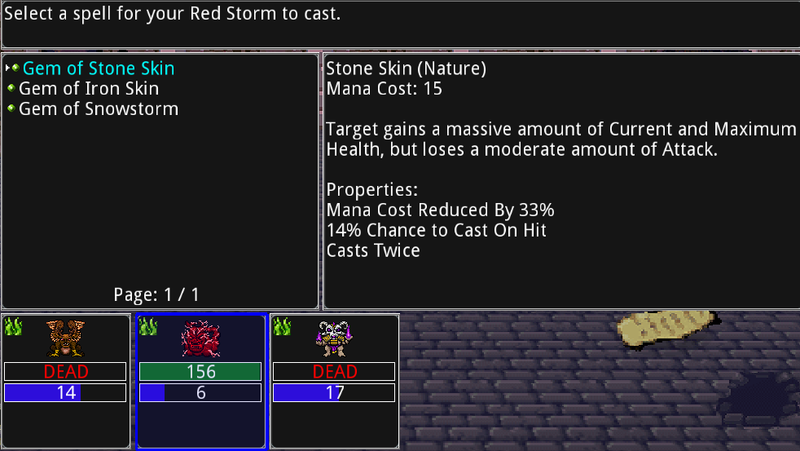 My lone creature is going to be taking lots of hits, so why not capitalize on it with a free spell cast? Thus, the Sand Giant is unequipped and left at the stables. My new Wolpertinger has a shiny sword a Shellburst gem. Out of play time! More on Day 2 to follow! Sounds like a band, eh? So to preface, this will be a journal of my new game / challenge. 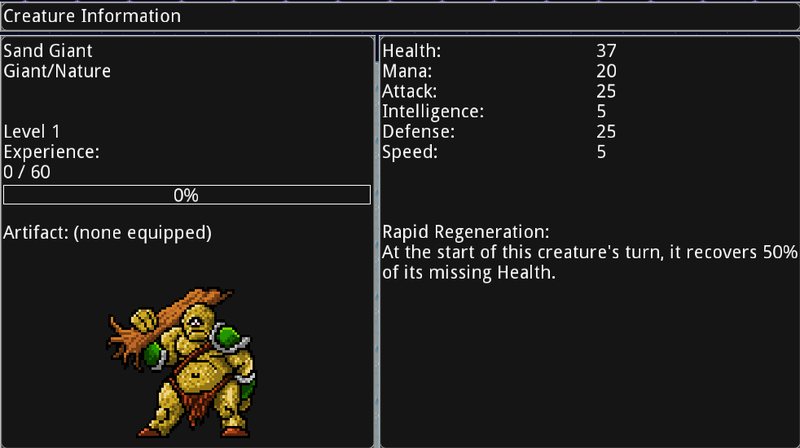 It will contain spoilers, and it will reference some of the more advanced concepts in Siralim. 1. Use 1 creature only. At all times where possible. 2. No punishments to limit enemy creature availability or matchups. This will be a 1v6 thing only. For obvious reasons, I've chosen to start Nature - seeing how that is where the Lone Wolf perk is located. Page created in 0.16 seconds with 55 queries.